Do you suffer from an achy back? So many people do, especially if they work at a desk job. Sitting down all day isn’t great for you and can lead to poor posture and stiff muscles. Yoga for back ache is tried and tested form of exercise. When I am not working for the Council or being queen of frugality, I am a yoga teacher, and have been for the past 10 years. Forget the hype about yoga. It may be the choice of many a celebrity and you may think you have to bend yourself up like a pretzel to do it, but actually it is very simple. You can practice at home or in a class, alone or with friends, you can be old or young, male or female, able bodied or have a disability. Please don’t think you need to be a gymnast either! You need a very small space to do it and a mat – that’s all. Yoga has kept me sane over many years, through pregnancy, motherhood, divorce and through my financial worries. As I hit 50, I found that working at a desk all day and gardening at the weekends started to take its toll on my lower back. For the first time I started to experience the aches and pains that I thought were just for other people! Hold onto the back of a chair or window sill. Aim to get a nice flat back and open under your arms. Straighten your legs if you can. Hold for 5 or 6 breaths. 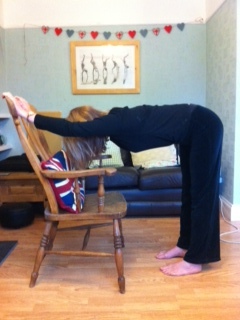 Starting from standing, soften your knees, and gradually curl down into a very soft forward bend. 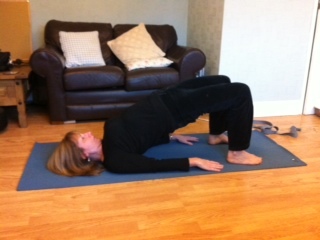 Keep your knees bent though – we are stretching the back gently not the hamstrings yet. Hold for 5 or 6 breaths and come up really slowly. Lie on the floor with your knees bent. On an out breath draw your right knee in towards you and, if it doesn’t hurt your neck, lift your head to look towards the knee. Hold for 10-15 seconds breathing normally, then release. Do the same with the left leg. Repeat 3 times on each side. If you get a lot of lower back pain you may have tight hamstrings. This is extremely beneficial for stretching them out. If you have a yoga or martial arts belt, great – if not, a dressing gown belt is perfect. Lie on the floor and place the belt under your right foot. Stretch the foot to the ceiling, keeping the ankle flexed (ie, don’t point your toes). Straighten your leg as much as possible. Hold for 30-60 seconds. Release and do the same on the left leg. If you have severe back pain, pile up some cushions to support your knees when you do this. 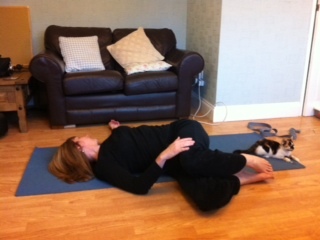 Lie on the mat and draw both knees in towards you. Tighten your tummy muscles and if necessary support the knees with your hand as you take them to the right. If your left shoulder lifts when you do this, you need to rest your knees on a couple of cushions. Move your head to the left if it doesn’t hurt your neck. Rest there for a minute or so, then support your knees back to the middle and change sides. Repeat twice on each side. Lie on the floor with your knees bent and your arms by your side. Your heels should be close enough in towards your bottom that you can almost touch them with your fingers. As you breathe out, press the small of your back into the floor. As you breathe in, release. Do these small pelvic movements a few times, then begin to lift your hips up off the floor, as far as is comfortable. Your toes should stay in contact with the floor and your feet should be parallel to each other. Hold for a few breaths then uncurl to the floor again. Imagine you could bring each vertebra to the floor before the next. Take a breath and repeat twice more. Finally, draw your knees in towards your chest and take hold of them. Rock gently from one side to the other. Rest for a few minutes. If you practise this sequence regularly you will hopefully find that your back becomes more flexible and that your back pain is more manageable. Try yoga for your back ache. If you find it helps consider finding a class. I recommend finding a British Wheel of Yoga qualified teacher here.